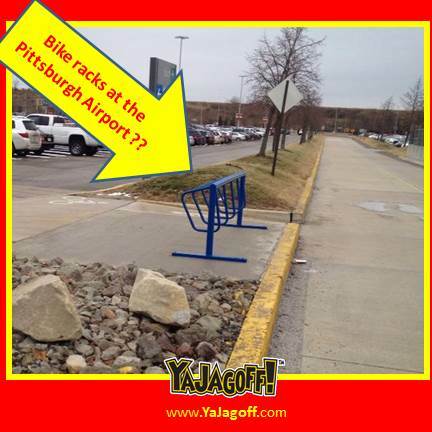 What you are seeing is a bicycle rack that has been installed at the Pittsburgh Airport. More specifically, you are seeing an EMPTY bike rack at the Pittsburgh Airport. We have had a friend on Facebook documenting this bike rack and.. the lack of it’s use since last July!!!! Our JIU (Jagoff Investigative Unit) has done it’s best on this one.. checking out rules for cycling on the highways leading do the airport as well as searching for really, really good reasons for installing a bike rack at the airport. As it turns out, you really ARE allowed to ride your bike on the the Parkway going to the Airport AND the Montour Trail actually, kind of, does lead to the airport. As an additional note.. the JIU staff saw absolutely ZERO people riding their bicycle, toting Pierre Cardin matching luggage bags OR even a backpack, trying to catch a plane to ANYWHERE! While we doubt that the bike rack was a budget-buster of any kind, we do wonder what in theeeeeeeeeeeeeeeeeeee hell is a bike rack doing at our airport which is located waaaaaaaaaaaaaaaaaaaaaaaaaaaaay out there in Findlay Township? Is this perhaps a crazy scheme to get more people to ride their bikes to the airport and therefore petition to have the airport moved to the Pittsburgh South Side??? Is this a prop eventually to be used in yet another movie to be shot in Pittsburgh… where Bruce Willis will ride a Huffy Bike with a banana seat and a 5-foot Sissy Bar and a Stargell Baseball card taped to the spokes along side a 747 taxiing down the runway and he jumps from the bike to the cockpit and stops the plane???? Hell, the Bruce Willis movie theory is just about as plausible as seeing a husband and wife come home from their 10-day Carribean Cruise, unlocking their bikes and cycling home to Verona. Can someone PA-leeeeeeeeeeeeeeeeze explain to us why County money and employee time were used to put in this bike rack, Ya Jagoffs??? 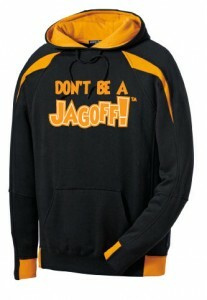 Click the pic to see how to order your own hoodie!! !